Wilwood's Classic Series front disc brake kits for Buick vehicles 1961 to 1964 (except Buick Special) and 1963 & 1965 Riviera, offer disc brake upgrade solutions for OEM Drum spindles. A completely new kit design, featuring a large 11.88" x 1.29” rotor and hub assembly. Based on the venerable forged billet Dynalite caliper, these versatile kits are easily optioned to suit the braking requirements and style preferences for a daily driver or the most discriminating show enthusiast. Intended vehicle applications require no modifications for installation, and provide plenty of clearance inside popular 15" wheels. FDL 1 piece kits can be used with either manual or power boost master cylinders. Kits are complete with calipers, rotors and, hub assembly brackets and hardware. Kit requires purchase of additional brake line kit shown below. 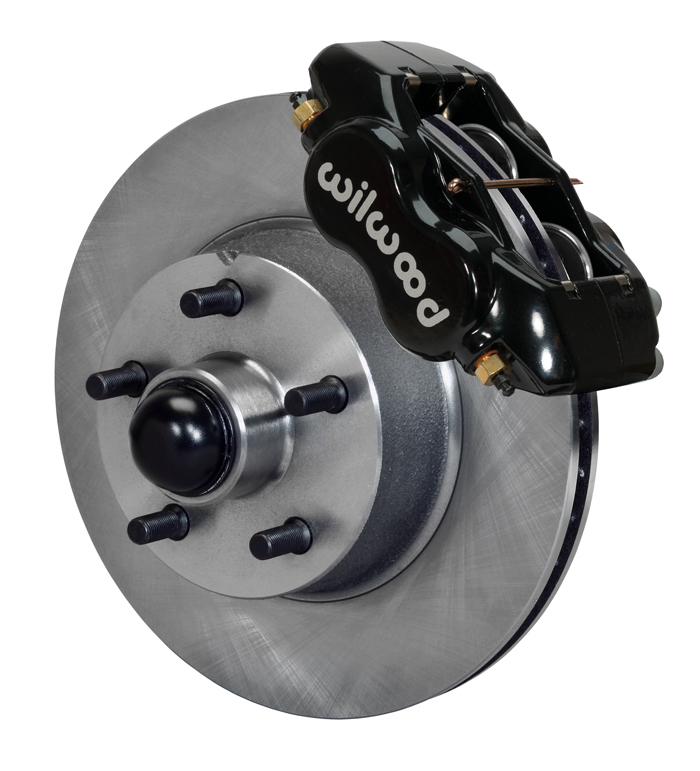 Wilwood's Classic Series front disc brake kits for Buick vehicles 1941 to 1956, offer disc brake upgrade solutions for OEM Drum spindles. A completely new kit design, featuring a large 11.88" x 1.29” rotor and hub assembly . 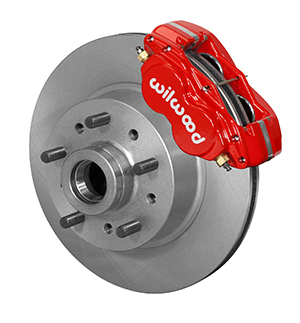 Based on the venerable forged billet Dynalite caliper, these versatile kits are easily optioned to suit the braking requirements and style preferences for a daily driver or the most discriminating show enthusiast. Intended vehicle applications require no modifications for installation, and provide plenty of clearance inside popular 15" wheels. FDL 1 piece kits can be used with either manual or power boost master cylinders. 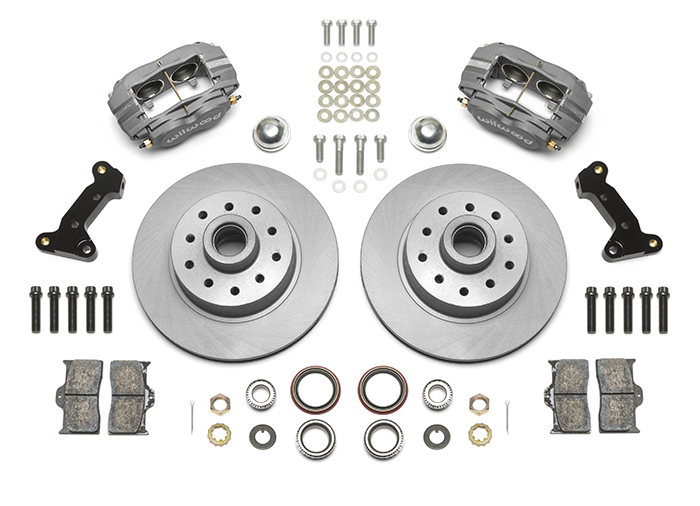 Kits are complete with calipers, rotors and, hub assembly brackets and hardware. Requires purchase of additional brake line kit shown below. 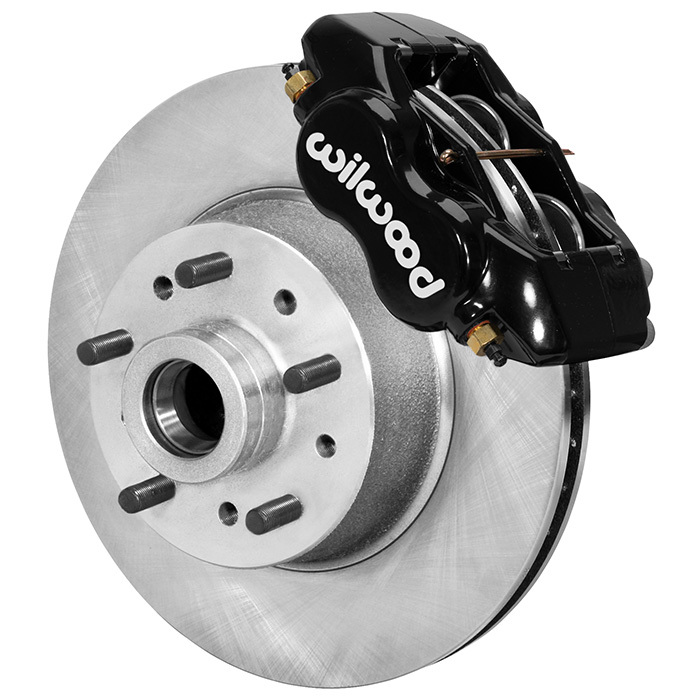 Wilwood's Classic Series front disc brake kits for Classic Performance Products GM Tri-5, 55-57 full size drop spindle offer easy and effective disc brake upgrade solutions for these aftermarket spindles. These kits feature the FDL-M four piston forged aluminum caliper and 11.50" diameter x 1.00” thick one-piece rotors. The FDL-M caliper is a modified version of the time-tested Forged Dynalite caliper, and provides the greatest amount of wheel clearance of any four piston caliper in its size class. The OEM style one-piece cast iron rotors with integrated hubs simplify installation while providing superb dimensional stability and wear resistance. 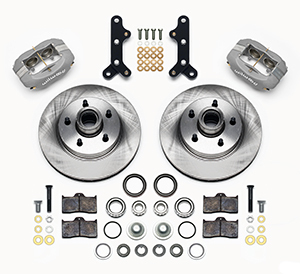 These versatile kits are easily optioned to suit the braking requirements and style preferences for a daily driver or the most discriminating show enthusiast. Intended vehicle applications require no modifications for installation, and clear most OEM 15" disc brake wheels. Classic Series FDL-M kits can be used with either manual or power boost master cylinders, and come complete with calipers, rotors, brackets, hardware and detailed installation instructions. Kit requires purchase of additional brake line kit shown below. Wilwood's Classic Series front disc brake kits for Chevrolet Full Size vehicles including 1965 to 1968 Impala offer disc brake upgrade solutions for OEM Drum spindles. A completely new kit design, featuring a large 11.50" x 1.00” rotor and hub assembly. 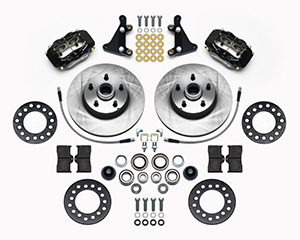 Based on the Forged Dynalite-M caliper, these versatile kits are easily optioned to suit the braking requirements and style preferences for a daily driver or the most discriminating show enthusiast. Intended vehicle applications require no modifications for installation, and provide plenty of clearance inside popular aftermarket 15" (disc brake) wheels. FDL-M 1 piece kits can be used with either manual or power boost master cylinders. Kits are complete with calipers, rotors and, hub assembly brackets, hardware. Wilwood's Classic Series front disc brake kits for 1965 to 1969 Ford Mustangs offer disc brake upgrade solutions for OEM drum or disc spindles. 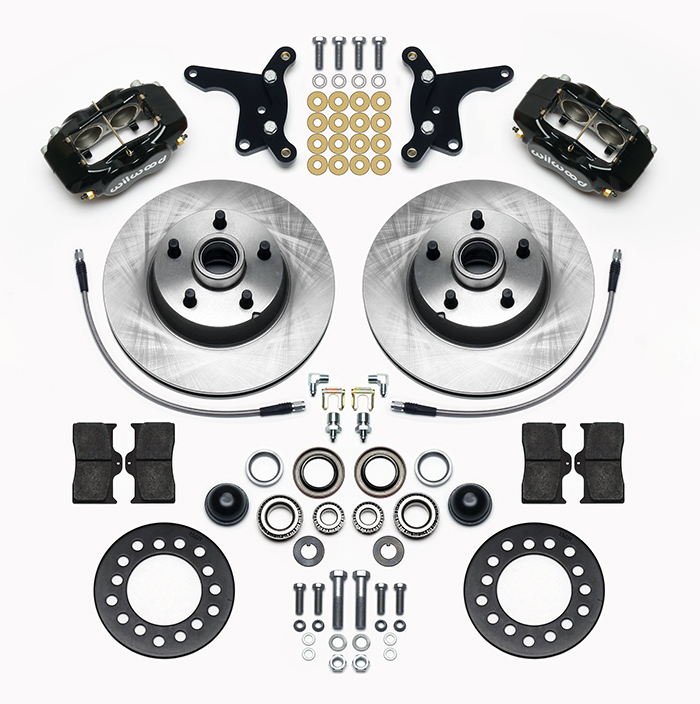 These kits feature the FDL-M four piston forged aluminum caliper and 11.30" diameter x 0.94” thick one-piece rotors. 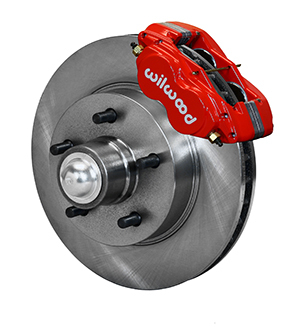 The FDL-M caliper is a modified version of the time-tested Forged Dynalite caliper, and provides the greatest amount of wheel clearance of any four piston caliper in its size class. The OEM style one-piece cast iron rotors with integrated hubs simplify installation while providing superb dimensional stability and wear resistance. 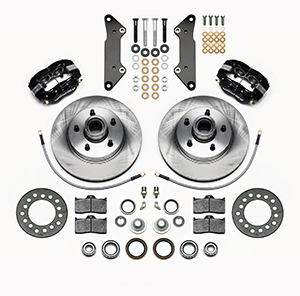 These versatile kits are easily optioned to suit the braking requirements and style preferences for a daily driver or the most discriminating show enthusiast. Intended vehicle applications require no modifications for installation, and clear most 14" OEM disc brake wheels. Kits will not fit OEM drum brake wheels. 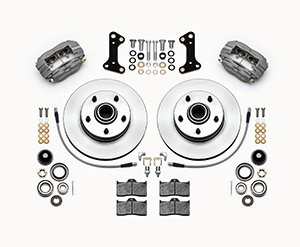 Classic Series FDL-M kits can be used with either manual or power boost master cylinders, and come complete with calipers, rotors, brackets, hardware, flex lines and detailed installation instructions. 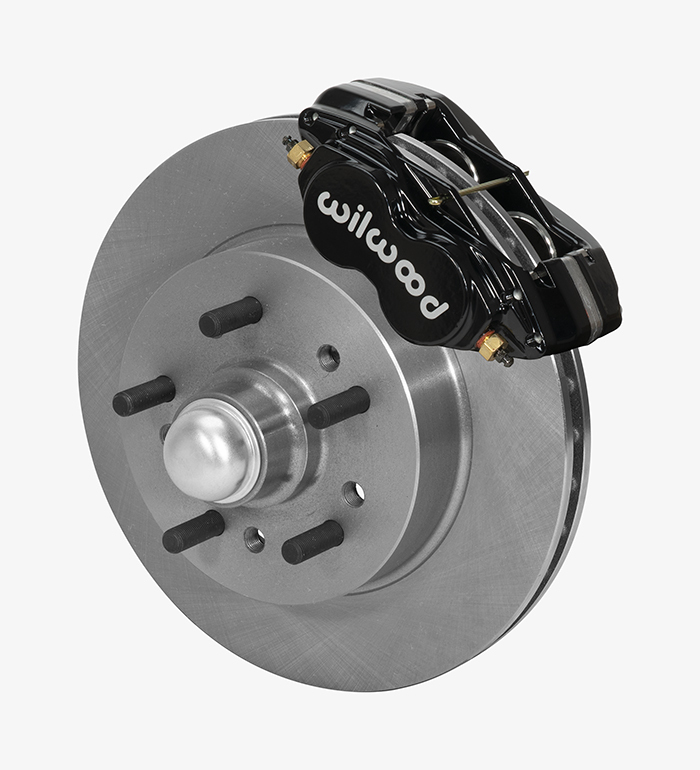 Wilwood's Classic Series front disc brake kits for 1970 to 1973 Ford Mustangs offer disc brake upgrade solutions for OEM drum or disc spindles. 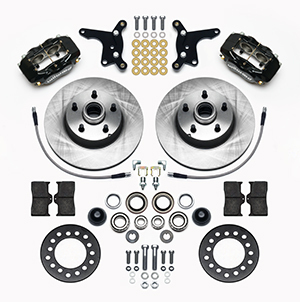 These kits feature the FDL-M four piston forged aluminum caliper and 11.30" diameter x 0.94” thick one-piece rotors. 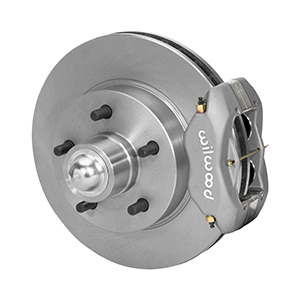 The FDL-M caliper is a modified version of the time-tested Forged Dynalite caliper, and provides the greatest amount of wheel clearance of any four piston caliper in its size class. The OEM style one-piece cast iron rotors with integrated hubs simplify installation while providing superb dimensional stability and wear resistance. 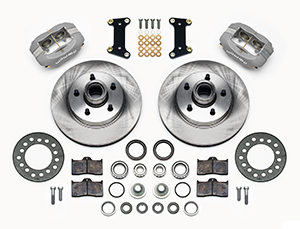 These versatile kits are easily optioned to suit the braking requirements and style preferences for a daily driver or the most discriminating show enthusiast. Intended vehicle applications require no modifications for installation, and clear most 14" OEM disc brake wheels. Kits will not fit OEM drum brake wheels. Classic Series FDL-M kits can be used with either manual or power boost master cylinders, and come complete with calipers, rotors, brackets, hardware, flex lines and detailed installation instructions. 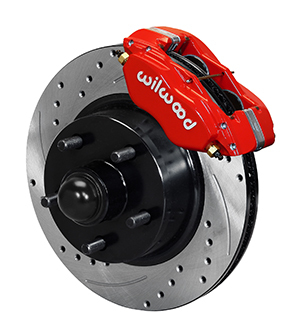 Wilwood's Classic Series front disc brake kits for 1960 to 1968 Ford & Mercury full size offer disc brake upgrade solutions for OEM Drum spindles. 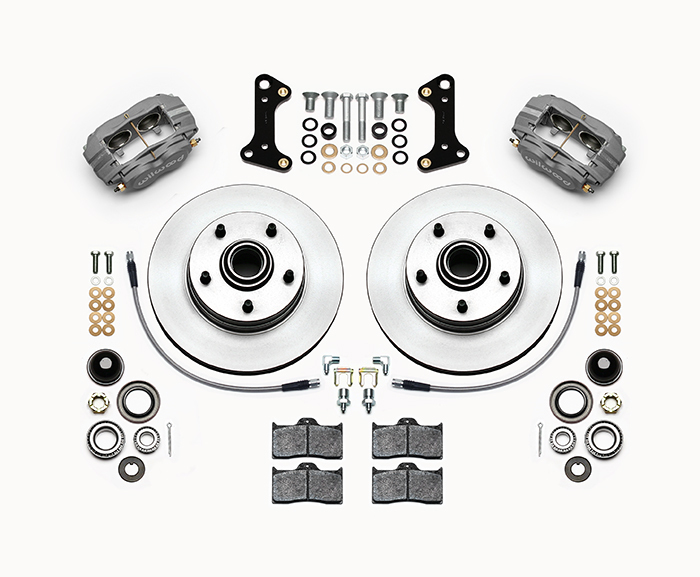 These kits feature the FDL-M four piston forged aluminum caliper and 11.30" diameter x 0.94” thick one-piece rotors. The FDL-M caliper is a modified version of the time-tested Forged Dynalite caliper, and provides the greatest amount of wheel clearance of any four piston caliper in its size class. The OEM style one-piece cast iron rotors with integrated hubs simplify installation while providing superb dimensional stability and wear resistance. These versatile kits are easily optioned to suit the braking requirements and style preferences for a daily driver or the most discriminating show enthusiast. Intended vehicle applications require no modifications for installation, and clear most 14" OEM wheels. Classic Series FDL-M kits can be used with either manual or power boost master cylinders, and come complete with calipers, rotors, brackets, hardware and detailed installation instructions. Wilwood's Classic Series front disc brake kits for Ford & select Mercury vehicles from 1949 to 1953, offer a disc brake upgrade solutions for OEM Drum spindles. A completely new kit design, featuring an 11.28" x 1.00” rotor and hub assembly. Based on the venerable forged billet Dynalite caliper, these versatile kits are easily optioned to suit the braking requirements and style preferences for a daily driver or the most discriminating show enthusiast. Intended vehicle applications require no modifications for installation, and provide plenty of clearance inside popular 15" wheels. FDL 1 piece kits can be used with either manual or power boost master cylinders. 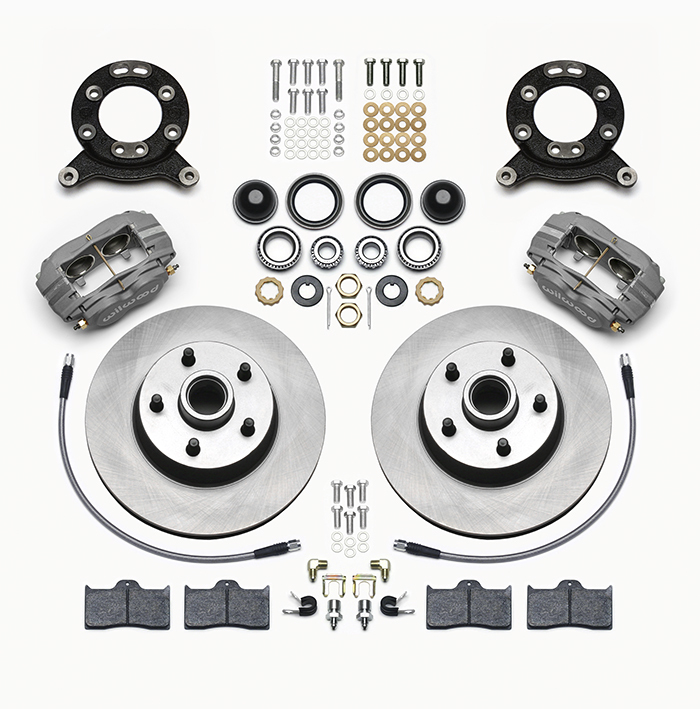 Kits come complete with calipers, rotors and, hub assembly, brackets, hardware and line kit. Wilwood's Classic Series front disc brake kits for Ford vehicles (including Thunderbird) from 1954 to 1956, offer disc brake upgrade solutions for OEM Drum spindles. A completely new kit design, featuring an 11.28" x 1.00” rotor and hub assembly. 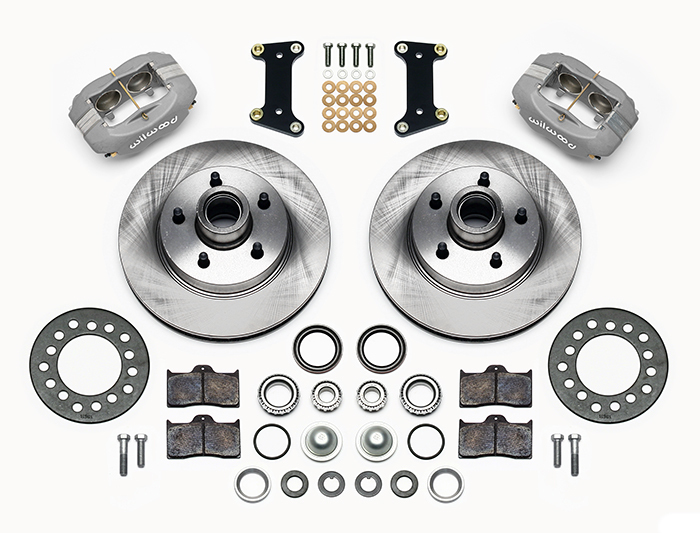 Based on the venerable forged billet Dynalite caliper, these versatile kits are easily optioned to suit the braking requirements and style preferences for a daily driver or the most discriminating show enthusiast. Intended vehicle applications require no modifications for installation, and provide plenty of clearance inside popular 15" wheels. FDL 1 piece kits can be used with either manual or power boost master cylinders. 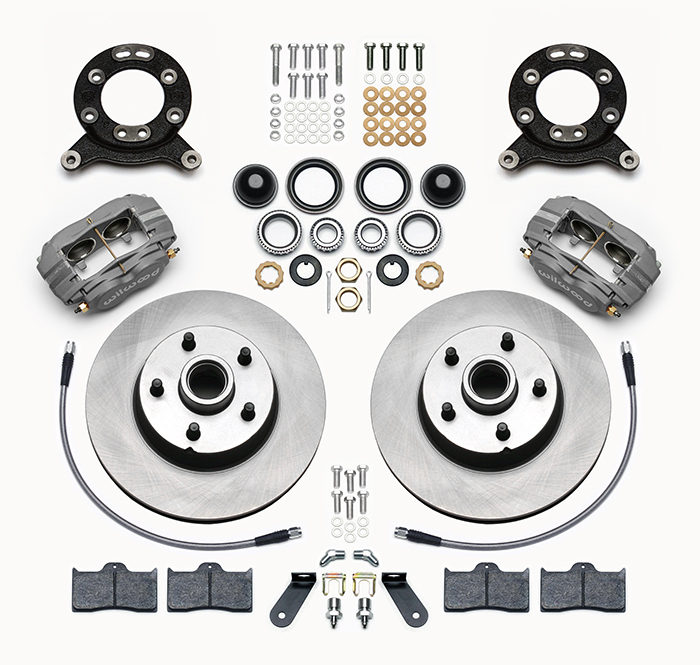 Kits come complete with calipers, rotors and, hub assembly, brackets, hardware and line kit. 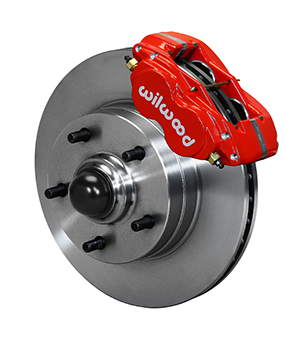 Wilwood's Classic Series front disc brake kits offer an economical braking solution for Wilwood Pro Spindles. A completely new kit design, featuring a large 11.03" x 0.88” rotor and hub assembly. Now upgraded with a new design dual bolt pattern rotor with screw in ½-20 studs, providing both a 5 x 4.50” and 5 x 4.75” wheel bolt circle options. 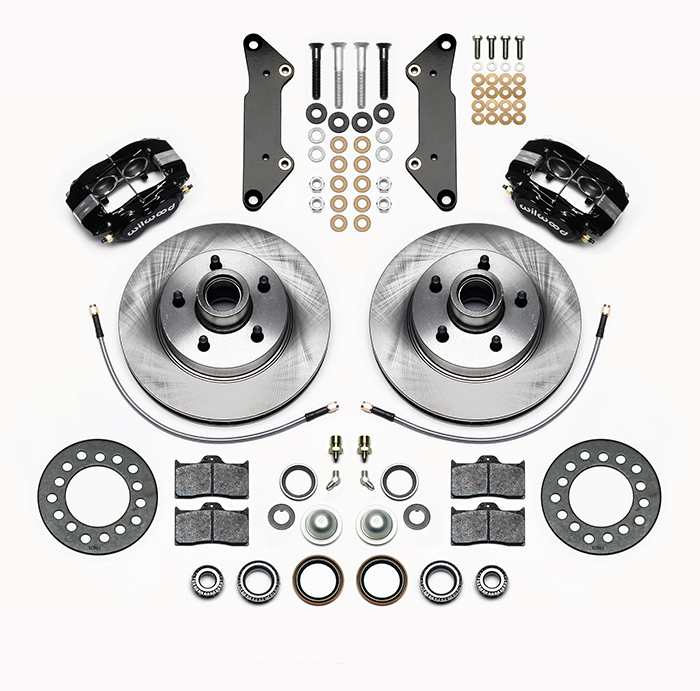 Classic Series kits are based on the venerable forged billet Dynalite caliper, these versatile kits are easily optioned to suit the braking requirements and style preferences for a daily driver or the most discriminating show enthusiast. Intended vehicle applications require no modifications for installation, and provide plenty of clearance inside popular 15" wheels. FDL 1 piece kits can be used with either manual or power boost master cylinders. 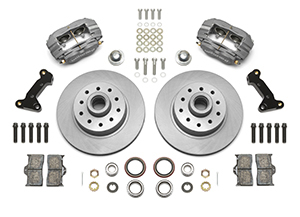 Kits are complete with calipers, rotors and, hub assembly brackets and hardware. Kit requires purchase of additional brake line kit. Wilwood's Classic Series front disc brake kits offer an economical braking solution for 74-78 Mustang II disc brake spindles. A completely new kit design, featuring a large 11.03" x 0.88” rotor and hub assembly. Now upgraded with a new design dual bolt pattern rotor with screw in ½-20 studs, providing both a 5 x 4.50” and 5 x 4.75” wheel bolt circle options. This Classic Series kit feature the FDL-M four piston forged aluminum Dynalite caliper. 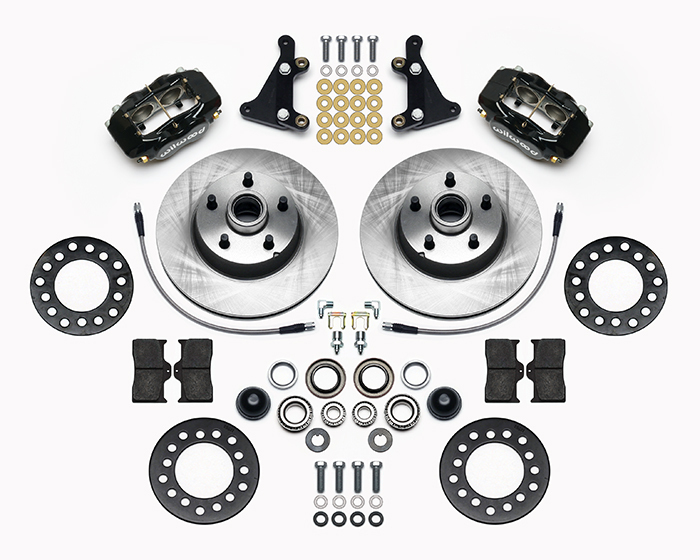 Kits are easily optioned to suit the braking requirements and style preferences for a daily driver or the most discriminating show enthusiast. Intended vehicle applications require no modifications for installation, and provide plenty of clearance inside popular 15" wheels. FDL-M 1 piece kits can be used with either manual or power boost master cylinders. 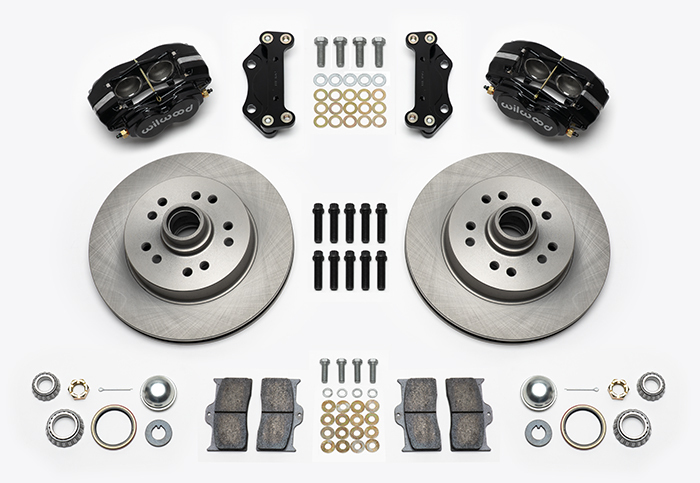 Kits are complete with calipers, rotors and, hub assembly brackets and hardware. Kit requires purchase of additional brake line kit. 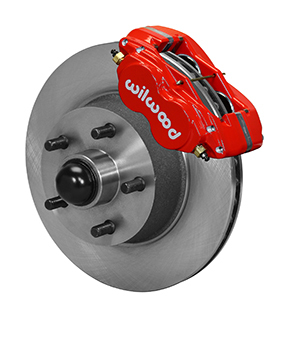 Wilwood's Classic Series front disc brake kits for 1964 to 1974 GM A-body, X-body and 1967-69 F-body offer disc brake upgrade solutions for OEM Drum & Disc brake spindles. 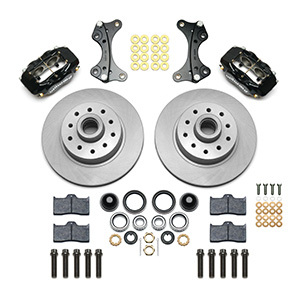 These kits feature the FDL-M four piston forged aluminum caliper and 11.00" diameter x 1.00” thick one-piece rotors. This new kit widens the track by only +.47" from original drum brake position or narrows by -.03" from the original disc brake rotor assembly. The FDL-M caliper is a modified version of the time-tested Forged Dynalite caliper, and provides the greatest amount of wheel clearance of any four piston caliper in its size class. The OEM style one-piece cast iron rotors with integrated hubs simplify installation while providing superb dimensional stability and wear resistance. 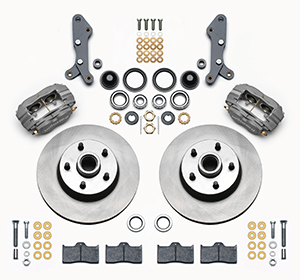 These versatile kits are easily optioned to suit the braking requirements and style preferences for a daily driver or the most discriminating show enthusiast. Intended vehicle applications require no modifications for installation, and clear most 14" OEM wheels. Classic Series FDL-M kits can be used with either manual or power boost master cylinders, and come complete with calipers, rotors, brackets, hardware and detailed installation instructions. Kit requires purchase of additional brake line kit shown below.